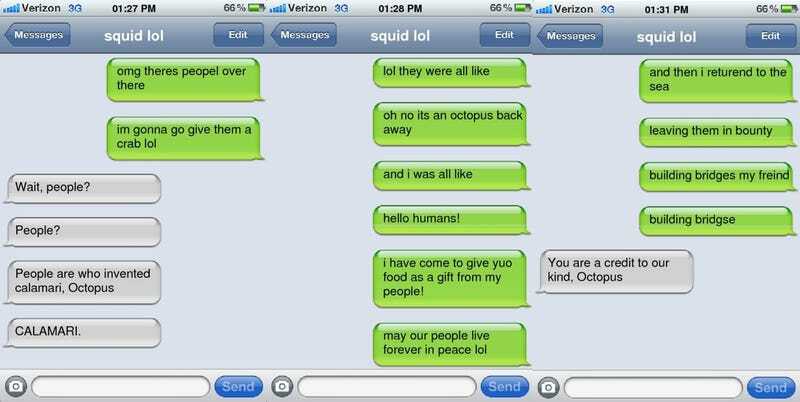 This is the way Texts From Cephalopods imagines the octopus in this video would describe those events. It turns out that the squid is the octopus' sensible friend. How can you not love these? First, there's an actual story about that most unnervingly intelligent of animals, the octopus. Then, the events are re-interpreted through the texts of an overly-enthusiastic octopus to his beleaguered squid friend. Everything about this is perfection. Below are the texts from my personal favorite type of octopus story: the escape octopus, but you should totally go check out all of them.